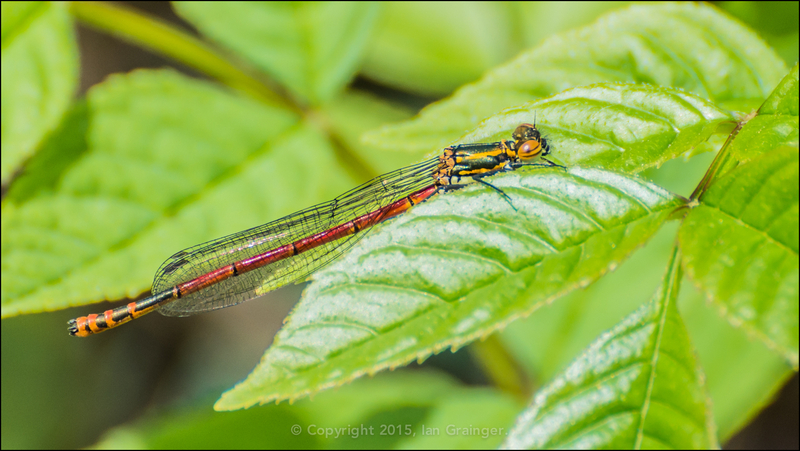 The culmination of a lovely week weather-wise saw the first damselflies arrive in the UK - the Large Red Damselfly (Pyrrhosoma nymphula). I was on the lookout for one on Sunday morning! Having spent the morning photographing various combinations of bugs and blossom with my macro lens, I hadn't been lucky enough to encounter a damselfly, so I switched to a longer lens to concentrate on shooting some bird life. I'd only fired off a couple of test shots when what should flutter across my viewfinder but this newly hatched specimen. As is the usual case when I have the choice of two lenses, I had the wrong one attached! Rather than take the chance of changing lenses, and losing track of her, I tried to persevere with my long telephoto zoom! It was like learning how to photograph insects all over again! With a minimum focus distance measured in metres not centimetres, a much smaller maximum aperture, and excessively high shooting speeds required to avoid camera-shake, I was definitely out of my comfort zone. Out of the five shots I managed to grab, this was the only one worth keeping. Although it's far from perfect, it's still my Image of the Week, as it will remind me to always keep my macro lens handy!